Directed by faculty experts, PROFS worked with a bipartisan group of legislators to introduce legislation related to University of Wisconsin research contracts. The faculty group, led by the late Mark Cook (Animal Science), identified the need to change state statutes that regulate how the university contracts with companies in which faculty or other university employees have a financial interest. AB 758 has passed the Assembly and PROFS is hopeful it will be scheduled for a Senate vote later this month. PROFS is also registered against AB 206, a bill that would restrict abortion-related activities of UW System and UW Hospitals and Clinics employees. UW School of Medicine and Public Health Dean Robert Golden testified in July the bill would seriously hamper student training in obstetrics and gynecology and could possibly jeopardize the medical school’s accreditation. PROFS is registered in support of legislation that would restore statutory language relating to tenure and shared governance to state statues. These provisions were removed as part of the 2015-17 state budget. PROFS is carefully monitoring two bills that would limit the use of fetal tissue in scientific research and is registered against Senate Bill 423. Our statement is on the PROFS website and Facebook page. PROFS is registered in support of this legislation that would eliminate several duplicative reports and allow graduate health science classes to start before September 1. PROFS is planning a campus forum on shared governance – what it is, how it works on a flagship campus that is part of a system, and why it leads to best business practices. A date and more details to come soon. PROFS President Dorothy Farrar Edwards and Legislative Representative Jack O’Meara will participate in the Wisconsin Alumni Association’s UW-Madison Day in Washington, DC on Wednesday, March 14. They will also meet with members of the Wisconsin Congressional Delegation during their time in on Capitol Hill. PROFS registered in favor of two recently introduced Senate bills. Senate Bill 823 restores tenure to state statutes and Senate Bill 824 restores university shared governance to state statutes. Both provisions had been in state law but were removed in 2015 as part of Act 55, the 2015-17 biennial budget. State Senator Fred Risser (D-Madison) and State Representative Dianne Hesselbein (D-Middleton) are lead authors of the legislation (below). University of Wisconsin Board of Regents President John Behling named members of the workgroup tasked with review of UW System chancellor and other top administrative positions (full press release below). The group will examine hiring practices and consider expanding the search process to include non-traditional candidates from outside academia. The committee does not include a member from UW-Madison. Last month, Regent President John Behling told fellow Regents he would like UW System institutions to recruit non-academic candidates and “streamline” the hiring process for top administrative positions. In June, PROFS asked the co-chairs of the Joint Committee on Finance to remove a budget provision that would prohibit UW System from creating a rule limiting candidates for chancellor and vice chancellor positions to individuals who are faculty members or hold terminal degrees in their field. No such rule currently exists, but UW-Madison’s Faculty Policies and Procedures does state the chancellor and provost must hold a tenured faculty rank. The University of Wisconsin System Board of Regents will meet at the Gordon Dining and Event Center at UW-Madison today, Thursday, December 8. Livestream coverage of the full board portion of the meeting is here. The Business and Finance Committee will hear the annual report on faculty turnover, which increased across UW System from an average of 5.9% to 8% in the last fiscal year. UW-Madison had the lowest turnover rate (5.3%), while five campuses experienced faculty turnover rates greater than 11%. The committee will also vote on the adoption of a statement in support of a pay plan request. The Capital Planning and Budget Committee will discuss several building projects, including UW-Madison’s Chemistry Building project and the renovation of Witte Hall. 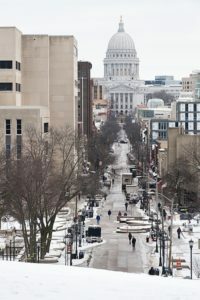 The Research, Economic Development and Innovation Committee will hear reports on UW-Madison’s Wisconsin Longitudinal Study and the WiSys Technology Foundation. The Audit Committee will discuss the Fiscal 2017 Audit Plan Progress Report and hear an update on the UW System Waste, Fraud and Abuse Hotline. The full board meets at 12:30 pm. Items on the agenda include UW-Green Bay’s annual Athletics Report and discussion of report of the UW System Task Force on Sexual Violence and Harassment. Governor Scott Walker spoke about UW System and recent faculty no confidence votes with Jay Weber on WISN radio yesterday. The pair touched on several subjects, including tenure (“jobs for life”), the possibility of extending the tuition freeze into the next biennium, shared governance and giving more power to the chancellors, strengthening free speech on campus, and “superstar” faculty members who bring in large amounts of research funding. The University of Wisconsin System Board of Regents is meeting today and tomorrow, April 7 and 8, at the University of Wisconsin-Green Bay. Livestream coverage of the full board meetings is here. The committee will also discuss and approve several new degree programs. The Business and Finance Committee will consider non-resident and graduate tuition increases at UW-La Crosse, UW-Milwaukee, UW-Platteville, UW-Stout and UW-Whitewater. The Capital Planning and Budget Committee will consider approval of the Design Report of the UW-Madison Music Performance Building (Hamel Music Center) and hear a report on State Building Commission actions and the 2017-19 Capital Budget proposal. The Research, Economic Development, and Innovation Committee will hear several reports including updates on the Talent Development Initiative and the WEDC Entrepreneurship and Innovation Program. The Audit Committee will hear several reports. They will also meet later Thursday in a joint committee meeting with the Business and Finance Committee where they will discuss two reports — an independent auditor’s report on financial statements and other reporting required by government auditing standards and the Wisconsin Legislative Audit Bureau report on the University of Wisconsin System. The full board meets Thursday afternoon and Friday morning. The board is expected to approve committee action, including possible changes to UW-Madison tenure policies, Friday. The board will also hear from student representatives on diversity issues.